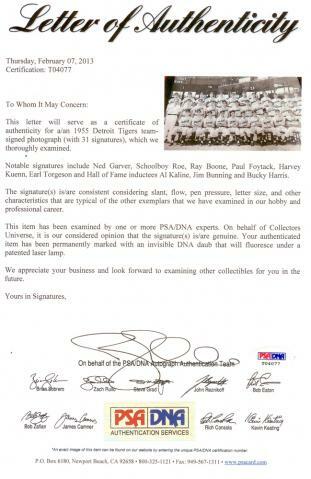 Here's a great piece of signed memorabilia that any Tigers fan would truly enjoy. Although this team finished well off the pace, the roster includes a number of well-known players. 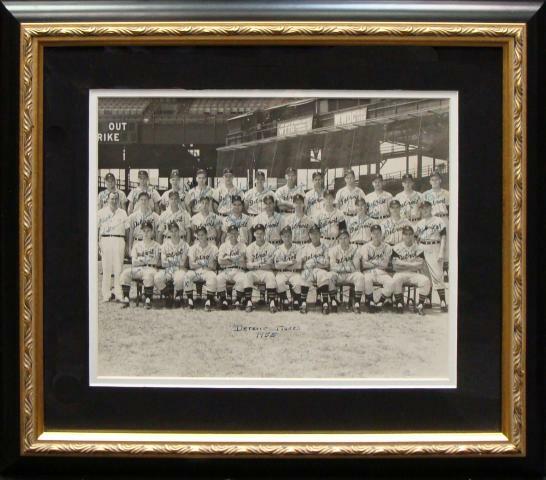 This is a very rare, FULLY signed team photo of the 1955 Detroit Tigers. Future Hall of Fame members Bunning and Kaline were just starting their careers - signatures done in fountain pen. A Full Letter of Authenticity from James Spence Authentication is included. Jim Bunning, Al Kaline, Mgr. Bucky Harris, Ray Boone, Harvey Kuenn, Schoolboy Mowe, Ferria Fain, Charley Maxwell, Ned Garver, Frank Lary, Billy Hoeft, Earl Torgeson and Billy Tuttle. Due to the rare nature of this item of this item we will charge your credit card for the full amount immediately upon taking your order. This policy ensures we reserve the photo for you. We will confirm your order by Email. Please allow at least 2 weeks for delivery. 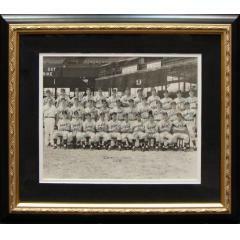 1955 Tigers Team Signed Photograph $2,495.00 Sold Out!